Smart dorm product because putting your mouth to a dorm sink is not too wise! 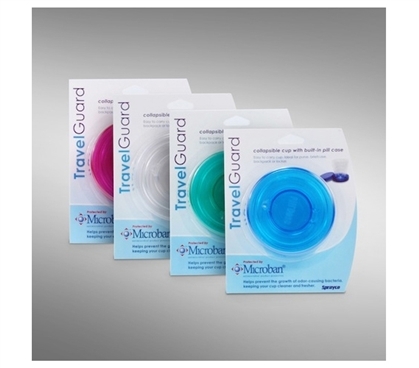 Our Microban Sink Cup with Built-in Pill Case is a space-saving collapsible cup that will fit directly in your shower caddy. This dorm bathroom accessory even comes with a built-in pill case to make transporting your medicine easy. Our Sink Cup with Built-in Pill Case is a Microban product that is designed with tip-top antibacterial protection to safeguard you from harmful germs. Dorm life almost always requires the use of a communal bathroom. Your best bet to easily transitioning in having to share a bathroom with your dorm floormates is to have dorm supplies that make college life easy. Our Microban Sink Cup makes brushing your teeth or taking a pill really easy. It'd be gross to stick your mouth to a dorm bathroom faucet, but with our Microban Sink Cup with Built-in Pill Case you can just fill it up and use this handy dorm supply as a mini cup.